After Porto’s incredible 2-1 injury time defeat of Benfica, we look at the key incidents in the ‘O Classico’ title decider and what we learned about both teams. Porto were patient in possession and waited to strike, while Benfica were happy to sit deep and counter attack. Porto attacked with the trio of James Rodriguez, Fernando and Sylvestre Varela pushing alongside Jackson Martínez. João Moutinho orchestrated play from midfield and was prepared to drop very deep in order to keep hold of the ball. When Benfica were defending, they played with almost a back five, with the left winger dropping into left back. Both sides played with ferocious intensity and the game slowed considerably in the final ten minutes. This made for an intriguing clash. Jackson Martínez has been one of the most prolific strikers in Europe this season with 32 goals in 38 games in all competitions. His movement was good tonight, but when there is poor service from the wings and creative players, it is difficult for a predator like Martínez to contribute goals. The Colombian will still likely be a target for other top European teams, so Vítor Pereira has his work cut out to retain his services. Nemanja Matić was very impressive in the centre of the Benfica engine. Not only did he break up play, his distribution was accurate and his surges forward pulled Benfica right up the pitch. This was despite being a doubt to play before the game. The 6 foot 4 Serbian finally looks to have developed into the player Chelsea hoped he would. After a loan spell at Rio Ave and spending the majority of this season in the B team, the 19 year old Brazilian has been a revelation. He scored a double against Braga recently and was a second half substitute tonight. He always looked dangerous and when the ball fell to him on his left foot in the 91st minute, he was the coolest man on the park, calmly stroking home into the bottom right corner of Arthur’s net. Cue pandemonium ensued at the Dragão. After Lima’s opener was cancelled out, Benfica largely settled for a point. 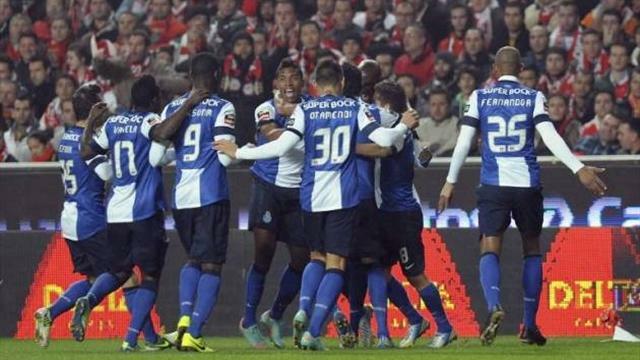 They defended well in the second half, but as they dropped deeper and deeper, Porto took advantage. Jorge Jesus and his players were visibly inconsolable, so it will be interesting to see if they can muster the energy to defeat Chelsea in Wednesday’s Europa League final.